Review | "The 100-Year-Old Man Who Climbed Out the Window and Disappeared"
After the death of his beloved cat, 99 year old Allan Karlsson (Robert Gustafsson) sets a dynamite trap for the fox that killed him. 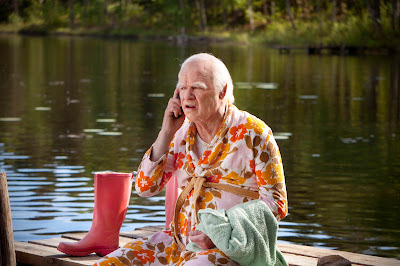 The trap kills the fox, but lands Allan in a nursing home. Never the type to be cooped up, Allan escapes out the window on his 100th birthday, heading anywhere but back to the nursing home. But a bag mixup at the train station leaves Allan in possession of a suitcase full of stolen money, making him the target of an international mob who will stop at nothing to get their money back. Along the way, Allan makes friends with an elderly train station keeper, a zoology student, a mobster's ex-girlfriend, and an elephant named Sonya who help him on his journey. Pursued by the mob, each mobster more incompetent than the last, the motley crew inadvertently does battle with an international crime syndicate through a series of accidents and misunderstandings, while all Allan wants to do is be free to live his life and blow things up. As they travel, Allan recounts his life story, one that lead him through many of the great events of the 20th century. Whether it was saving the life of General Franco, helping Robert Oppenheimer with the Manhattan project, or becoming a double agent for Russia and the USA during the Cold War, eventually helping bring down the Berlin Wall, Allan always seemed to accidentally move history forward. You'd be forgiven if you thought it sounded a bit like Forrest Gump, because it absolutely is. And while Allan's history doesn't have that much to do with the main plot, it adds to the film's droll sense of humor. Allan rarely seems to understand the gravity of any situation, blithely recounting stories from his past to anyone who will listen, even at the most inopportune times. It all has the feel of a tall tale spun by an old man exaggerating events from his life. It's whimsical and consistently amusing, managing to get by on good old fashioned charm even in its similarities to Forrest Gump. Gustafsson is a delight in the lead role, playing Allan from young man to old in such a way that I was almost reminded more of Powell and Pressburger's The Life and Death of Colonel Blimp than Forrest Gump. 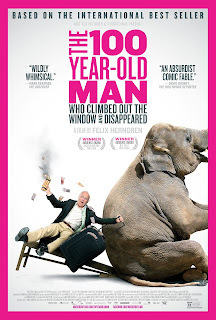 The 100-Year-Old Man Who Climbed Out the Window and Disappeared never overplays its hand, it never feels schmaltzy or forced, and has just enough dark humor to keep from being maudlin. Director Felix Herngren knows better than to take such an inherently absurd tale and turn it into a weepie. He lets the simple charms of the story speak for themselves. The result is an irresistible and endearing adventure that is pure escapism, a rare type of cinema magic that is as transporting as it is captivating. This one is a real diamond in the rough. 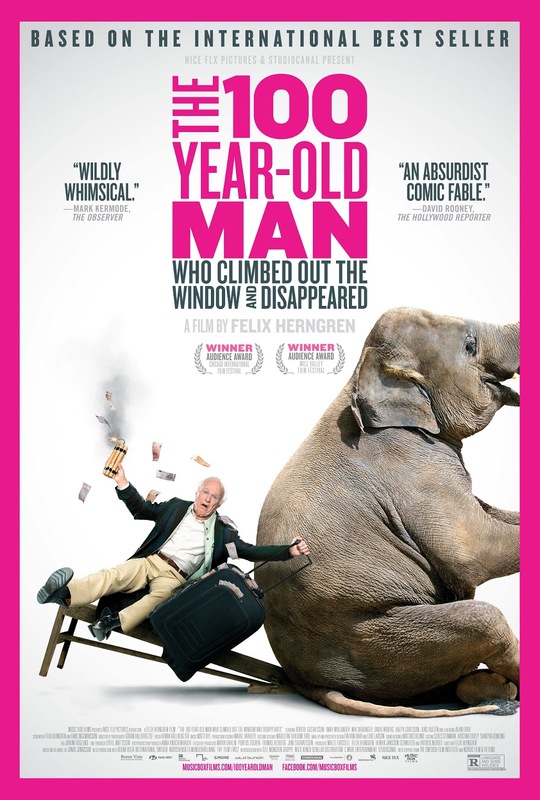 THE 100-YEAR-OLD MAN WHO CLIMBED OUT THE WINDOW AND DISAPPEARED | Directed by Felix Herngren | Stars Robert Gustafsson, Iwar Wiklander, David Wiberg, Mia Skäringer, Jens Hultén | Rated R for language and some violence | In Swedish & English w/English subtitles | Opens tomorrow, May 8, in NYC, LA, San Diego, and Atlanta. Opens nationwide soon.